I am in a book club. For this book club, I have gone to three meetings. We picked out our first book last week and will be discussing it in February. Instead of reading, we've been getting together, eating, talking babies (since many of the girls are having or already have babies), and for one of the meetings, we had a cookie exchange! I was told that it is best to make one kind of cookies for everyone. I was also told to bring 1/2 dozen for everyone meaning about 7 1/2 dozen cookies. That's a lot of cookies. I got to work searching for the best recipe and while I had never tried these, they are now my new favorite. I tripled the recipe below. In a stand mixer ( or you can use a hand mixer but know that the dough gets TOUGH and could break the hand mixer... mine started to get a little iffy), cream together white sugar and butter. Beat in eggs one at a time, and then stir in the vanilla. Once mixed add the coco powder slowly making sure to mix very well. 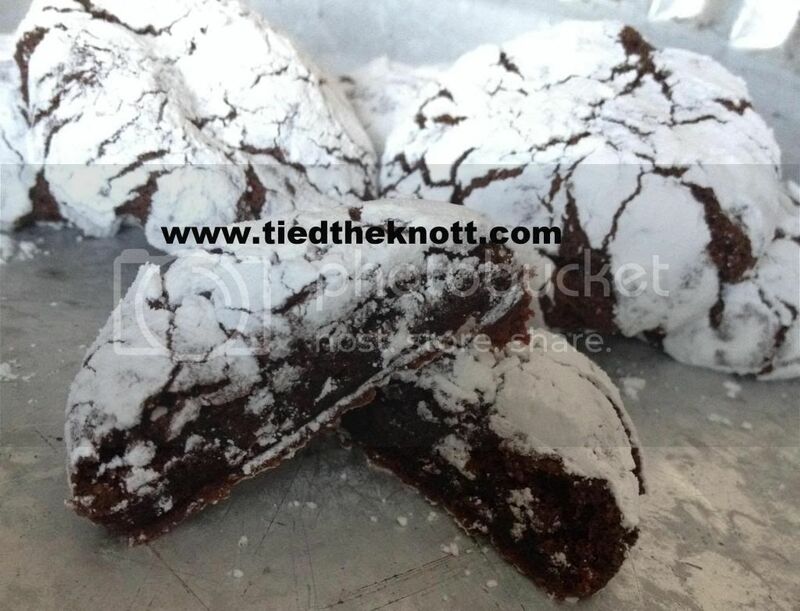 Combine the flour, baking powder, and salt; stir into the cocoa mixture. Let me just warn you this dough is THICK and STICKY! Cover the dough and chill overnight (makes it easy to work with). Preheat the oven to 350 degrees & Line 2-3 cookie sheets with parchment paper. Roll dough into one inch balls (I used a cookie scoop and they were all about the same size) and place them on a parchment lined cookie sheet. Chill the cookies for 10-15 minutes just to firm them back up. In a bowl add the confectioner’s sugar. Roll each dough ball in the sugar making sure to coat the cookie as much as possible. Place the cookie balls back onto the parchment lined cookie sheets. Bake in preheated oven for no more than 10 to 12 minutes (otherwise they get hard). After baking, remove from oven and let stand on the cookie sheet for a minute before transferring to wire racks to cool. yum...but I don't think these would work in my diet! They look so pretty. In fact, they would look gorgeous in a little bag with ribbons for a gift.